This is not the first time I have used a picture of a squirrel here on Weekly Fifty, and it won’t be the last either. I’ve realized over the years that I really like photographing these little rodents and even though the overall nature of many of the pictures is kind of similar (i.e. a squirrel sitting or eating or both) it’s fun to actually go out and get the shots. Kind of like how some people go to Starbucks (or if your up north, Caribou Coffee) and order the same thing each morning: it’s not fancy, but it’s familiar and it’s something you just enjoy doing. 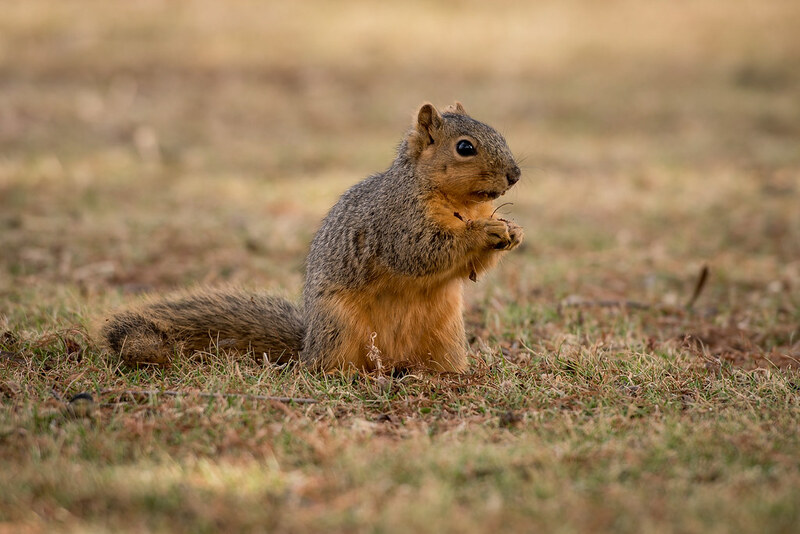 That’s kind of me when it comes to squirrels, especially the ones at Theta Pond because they are a little less skittish around people than most wild animals. When I shot this it was a particularly warm day in mid-February and I brought my D750 + 70-200mm lens to campus simply because I knew it would be a nice day out and I figured I would get the chance to go out and shoot some pictures with it. Sometime in the early afternoon I did just that–I went on a five-minute walk around the pond with my camera, taking pictures of squirrels and maybe a duck or two. Nothing fancy, but it was fun, and that’s what matters to me. I also tried to pay attention to the types of shots I was getting, and look for squirrels that were doing something interesting or positioned in a way that made the photo more compelling to look at. As I went through my pics I liked this one the best because something was actually happening in it, as opposed to a squirrel just standing around. I caught this little fella in the middle of a snack and it looks like he paused a bit to let me take his picture, though more likely he was spooked by the giant lens pointed in his direction. I like that it’s kind of a 3/4 angle shot where he’s not fully sideways but not fully…uh…looking right at me either, which was more visually compelling than some of the other pictures I ended up taking. I think you described my bird photography. It’s fun, it’s comforting and I still get satisfaction out of a good shot. It’s calming to do something you know well and can do well. I just zoomed in on this picture – I love how sharp and clear it is! This made me smile! As I was sorting through my animal photo folder, I couldn’t believe how many squirrel pics I had. There is just something about these little fellas that brings out my camera! Thank you for sharing this pic with us. I know what you mean Carolana. They’re just so darn photogenic, and they’re all over the place too! That’s a nice way of putting it, Dennis. It might not be new and groundbreaking to repeatedly photograph the same subjects, but just like you said I feel like it helps me see what I’m doing well and where I need to improve.